The cycle-rickshaws are one of Bangladesh's most important modes of transport. According to government estimates, they contribute one-third of the total value-added in the transport sector. There are probably more than 750,000 of them, and they employ over one million people. Yet in the past rickshaws have been almost entirely overlooked by policy-makers and researchers. For example, both the Third and Fourth Five Year Plans devoted only a couple of lines to them. This oversight is largely because the rickshaws are seen as inefficient, inhumane, and a symbol of under-development. Due to this negative view, the official government policy is to phase them out as soon as possible, and replace them with motor vehicles. However, the rickshaws keep on increasing, and in the coming years their numbers will certainly rise. It would be best, therefore, to accept them, and plan for their future accordingly. This book was written to try and find practical ways of helping the people who operate the rickshaws, and the passengers who use them. 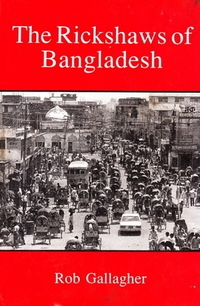 Part One looks at the history of rickshaws, in Bangladesh and other countries. Part Two looks at the urban traffic problem, and compares the rickshaw with other modes in terms of efficiency, road safety, and effect on traffic congestion. Part Three looks at the scope for improving the rickshaw's technical design. Finally, Part Four looks at the people of the rickshaw industry, and their trade unions and co-operatives.